Please refer to our stock # 3293 when inquiring. 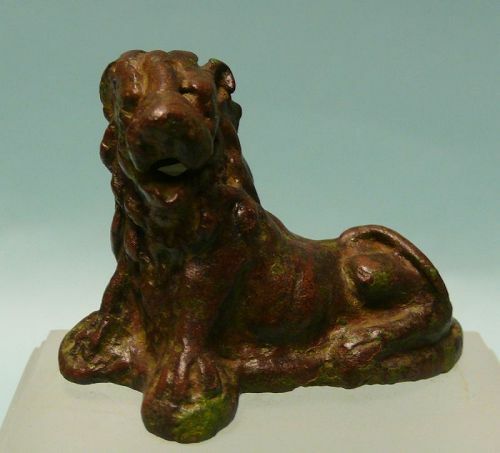 Roman Bronze Reclining Figure of a Lion, ca. 2nd - 3rd Century CE. 1 1/2" x 2 1/4" x 1 1/2", on stand 2 1/2" high. In excellent condition. Ex: S. Beiner collection, Florida. Cultural depictions of lions are known in European, African and Asian countries. The lion has been an important symbol to humans for tens of thousands of years. The earliest graphic representations feature lions as organized hunters with great strength, strategies, and skills. In later depictions of human cultural ceremonies, lions were often used symbolically and may have played significant roles in magic, as deities or close association with deities, and served as intermediaries and clan identities.